One of our blog readers made an excellent point in response to Part I of this series of blog posts (Thank you Katie!). She stated that most mysteries are more plot-driven than character-driven. This explains why in some mystery novels, the characters seem a little flat. Luckily, I believe I have found a mystery writer whose stories are both plot and character driven: Dennis Lehane. So far I have read two of his novels (and am almost done with a third): Shutter Island and Gone Baby Gone. Both of these novels are compelling stories with fascinating and well-developed characters. Shutter Island revolves around a U.S. Marshal traveling to an insane asylum on a remote island to investigate the disappearance of one of the inmates. The characters and the plot of this story are quite complex. For instance, along the way we learn that U.S. Marshal Teddy Daniels is on the island for personal as well as professional reasons. I don’t want to give anything away (although many have probably seen the film), but suffice it to say that this is one “missing persons” mystery with a whole lot going on. 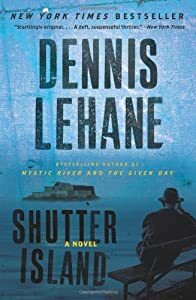 If you pay close attention while reading the book, you may well figure out a significant part of the mystery, but the strength of this book is that even if you have figured it out before the end, the storytelling abilities of Mr. Lehane inspire you to read on. In this novel the characters and the plot were very well-developed and as a writer I was fascinated to see how the author wove the complicated threads of the story together. For those of you that saw the movie without reading the book, I encourage you to pick up a copy. You will find the writing interesting and even knowing the end can’t take away from the power of the characters and the potency of a truly great mystery.